To date textbooks on viruses infecting fish, crustaceans and molluscs, the three main aquatic animal farmed groups, have been on the whole “diseases-centric” and individual viral diseases selected based on “epizoo-centric” approaches with little to no coverage of the basic biology of the viruses, in contrast to textbooks on viruses infecting terrestrial – farmed, pet, and free-range (wild) – animals and humans. Despite considerable advances in animal virology in recent years coupled with an economically important global aquaculture industry, knowledge of viruses of animal aquaculture is still sparse and in some cases outdated although these viruses are closely related to well-known virus families. The last book in fish virology (Fish viruses and fish viral diseases 1988, Wolf, K.) was published in the 1980s. A lot of work has been done on fish viruses and many new aquatic animal viruses continue to be discovered. Aquaculture Virology provides the current state of knowledge of aquatic animal viruses within the current virus classification and taxonomic context thereby allowing the reader to draw on the principles of general virology. This book is a systematic and concise resource useful to anyone involved with or looking to move into aquaculture and fisheries. 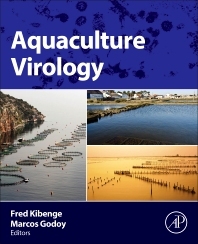 Clinical veterinarians, aquaculture disease practitioners, biologists, farmers, and all those in industry, government or academia who are interested in aquatic animal virology will find this book extremely useful. Dr. Fred Kibenge is Professor of Virology at the Atlantic Veterinary College, University of Prince Edward Island, Charlottetown, P.E.I, Canada, where he has been Chairman of the Department of Pathology and Microbiology for several years, and teaches veterinary virology in the second year of the DVM curriculum. He has been working with animal viruses for more than 30 years in addition to prior extensive post-doctoral research experience in virology in UK and USA. He is a Diplomate of the American College of Veterinary Microbiologists, ACVM (sub-specialty Immunology). He has published extensively on the detection and virology of fish viruses. Dr. Marcos Godoy has done extensive research in fish diseases, specifically in salmon aquaculture in Chile, with Dr. Kibenge, working in aquatic animal virology to better understand aquatic animal diseases for the prevention and control of such diseases of farmed fish for a sustainable and safe food supply. Veterinarian, Marine Biologist, Universidad San Sebastian, Medicina Veterinaria, Puerto Montt, Chile; Centro de Investigaciones Biológicas Aplicadas (CIBA), Puerto Montt, Chile.